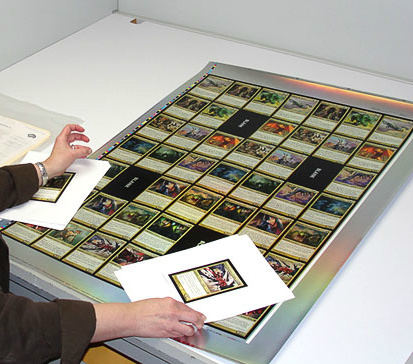 Magic cards are printed on sheets. 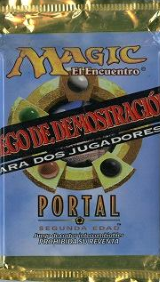 Usually the number of cards in a set and the rarity distribution are chosen in a way that all slots on a sheet are filled but occasionally, especially when printing box sets or preconstructed decks, some slots remain unused. These slots are then occupied with filler cards. Normally these cards are sorted out prior to packaging, but sometimes a few of them slip through. 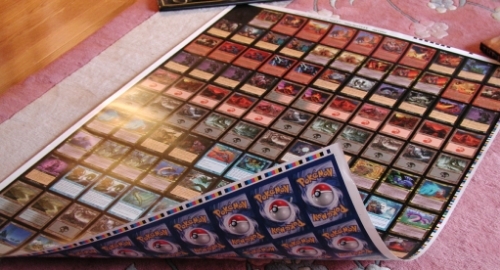 A Vanguard Filler and a Black Filler card with Pokemon Back are known to exist from uncut sheets. 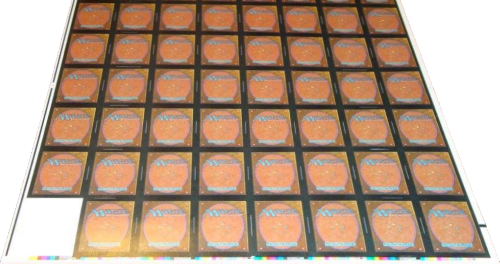 Regarding the Vanguard sheets, Series #1 has all 49 (7 x 7) spots filled with Vanguard cards. There is an odd distribution of the 8 cards, probably so some of the extras could be given out as promos. 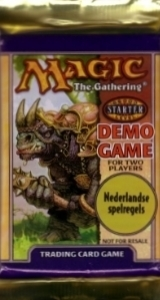 The Series #2 sheet has 6 copies of each card. 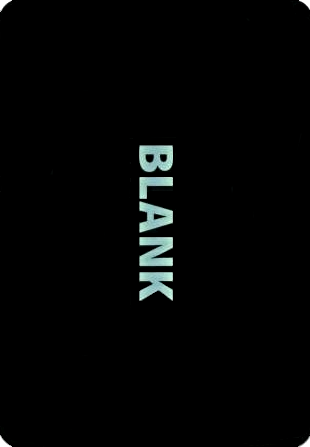 The bottom right spot is left white, and has the typewritten word "Blank" as the only identifying feature.  The word is sized at ~ 14 point font, is about 1/4 to 1/3 down from the top, and is to the left of center. If the sheet were to be cut (to a normal cut for Vanguard cards) it would probably look like filler #50: Two Sides Black Border filler card. 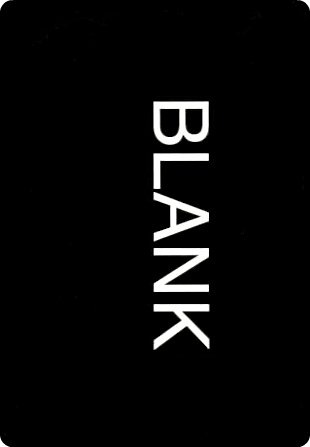 The difference would be that the black borders would be on the top and left, and this Vanguard filler would contain the word "blank". Two Sides Black Border "Blank" filler card from Vanguard Series 2 uncut sheet. This filler was never found in a booster so far, that's why it's not included in the Fillers tab. 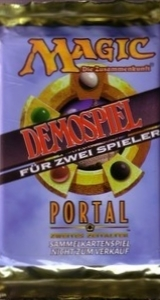 Regarding the Black Filler with Pokemon back, the filler card, in the top-left corner of the sheet, is pure black. If it were to be cut with rounded corners like a normal card, it would be filler #18: Black Round Corner filler card . If it were cut with square corners (The easiest way to cut this sheet) it would be filler #23: Black Square Corner filler card. Since the sheet is uncut it could be either. English sheets Made in Belgium and Made in USA can be different (one sheet can have a filler while the other don't). Also I have noticed that some English Sheets Made in Belgium while having fillers on them, the English version Made in USA the fillers are replaced by extra cards, this happened on a bunch of recent sets. Now, for some regular set, you can have up to 16 Different sheets, add on top all the sheets used for sealed products for that specific set. Alternate Fourth Edition Filler Card from Alternate Fourth Edition Uncommon 10 uncut sheet front. 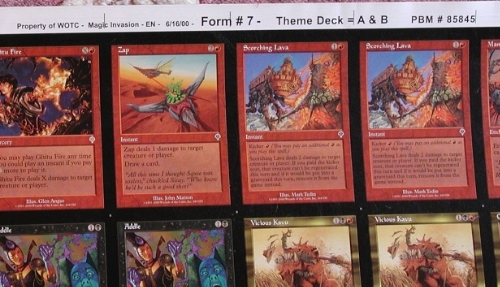 Alternate Fourth Edition Filler Card from Alternate Fourth Edition Rare 18 uncut sheet front. 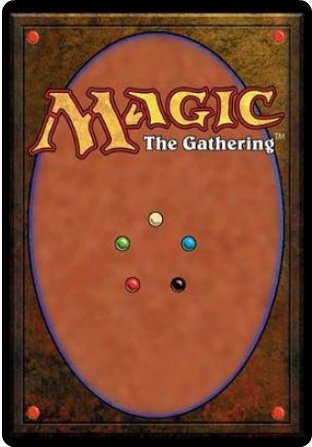 Alternate Fourth Edition Filler Card from Alternate Fourth Edition Rare 19 uncut sheet front. 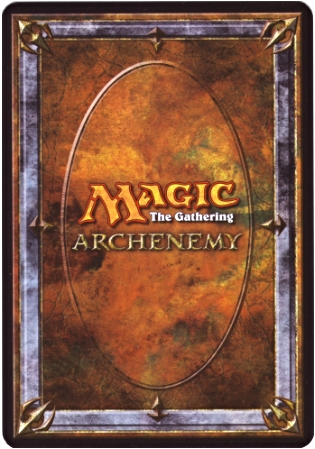 Alternate Fourth Edition Filler Card with Two Sides Black Border back from Alternate Fourth Edition Rare 18 uncut sheet back. This filler was never found in a Starter so far, that's why it's not included in the Fillers tab. 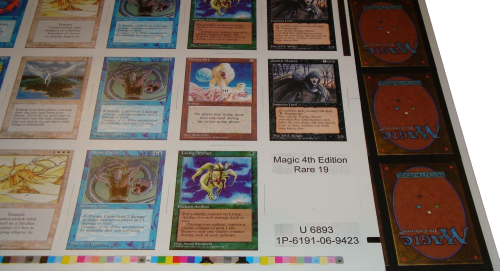 Black Border Foil with Barcode Filler Card from Avacyn Restored Foil Uncommon uncut sheet. Supposed to be with MTG back (to be verified). This filler was never found in a booster so far, that's why the source is not included in the Fillers tab. Black Border Foil ? 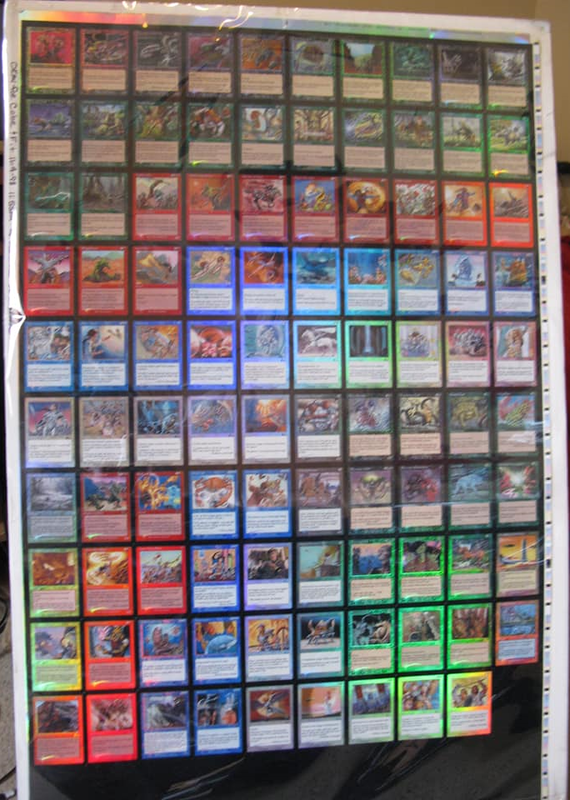 with Barcode Filler Card and MTG Back from Korean Journey Into Nyx Foil Rare/Mythic uncut sheet. 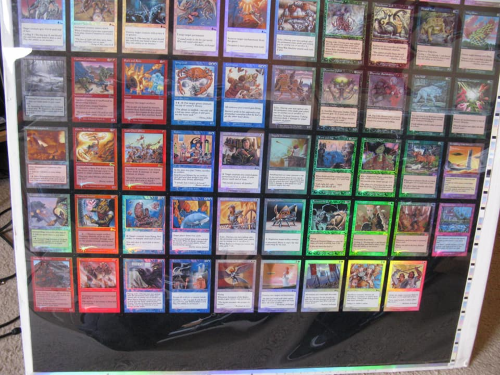 There's also Black Border Foil ? 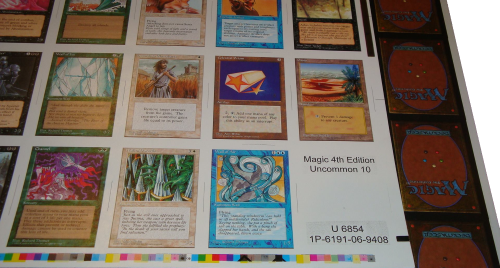 with Barcode Filler Card and MTG Back from Korean Journey Into Nyx Foil Uncommon uncut sheet. Black Border with Barcode Filler Card from French M13 Foil Uncommon uncut sheet. 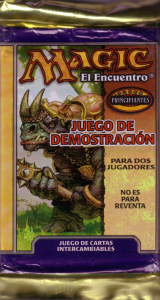 Back is normal MTG Card. Black Border Foil ? with Barcode/ Black Border Filler Card with Holofoil Stamp from Eldritch Moon Rare/Mythic Melt and Double Faced cards Foil uncut sheet front. This filler was never found in an Eldritch Moon booster so far, that's why that specific source is not included in the Fillers tab. 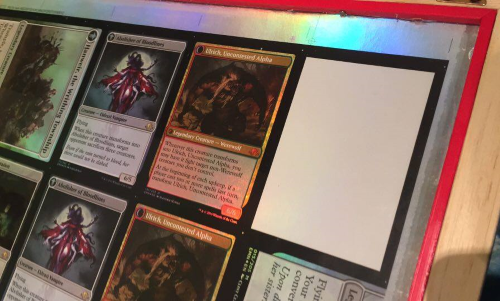 Black Border Foil ? with Barcode/ Black Border Filler Card with Holofoil Stamp from Eldritch Moon Rare/Mythic Melt and Double Faced cards Foil uncut sheet back. 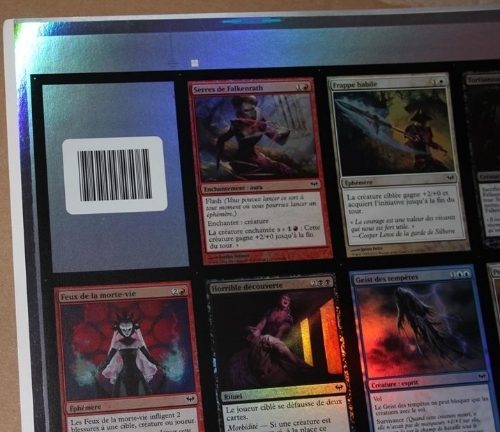 Black Border Foil with Square Barcode from French Dark Ascension Foil Common uncut sheet. 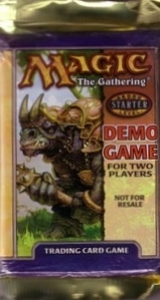 Back is normal MTG Card. 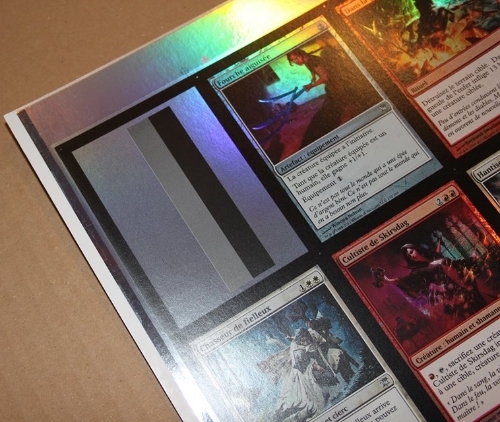 Black Border Long Stripes Foil Filler Card from French Innistrad Foil Uncommon uncut sheet. 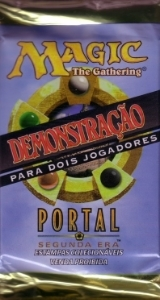 Back is normal MTG Card. Two Sides Foil Black Border/Black Border Stripes Filler Card Back from M12 Foil Uncommons uncut sheet. Black Round Corner or Black Square Corner Filler Card on top left from Invasion Blowout and Dismissal Theme Decks with Pokemon Back uncut sheet (printed by PBM). Invasion Blowout and Dismissal Theme Decks uncut sheet with Pokemon Back.Label. Black Round or Square Corner Filler Card on top left from Invasion Blowout and Dismissal Theme Decks uncut sheet with Pokemon Back. Black Round or Square Corner Filler Card from Invasion Blowout and Dismissal Theme Decks with Pokemon Back uncut sheet. 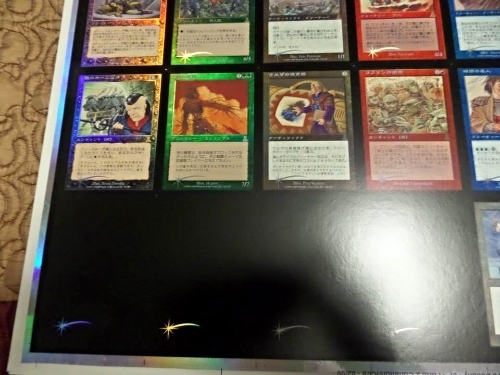 Black Round or Square Corner Foil Star Filler Card from Japanese Urza's Destiny Foil Common/Rare uncut Sheet. 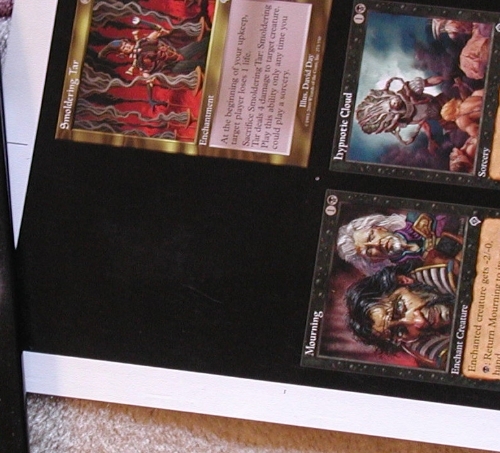 Black Round or Square Corner Foil Star Filler Card from French Urza's Destiny Foil Common/Uncommon uncut Sheet. 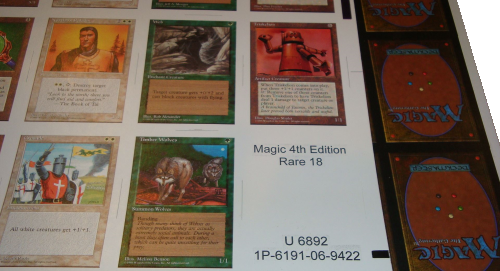 Black Round or Square Corner Shiny Filler Card on from Italian Urza's Legacy Foil Common/ Uncommon 10 x 11 uncut sheet. 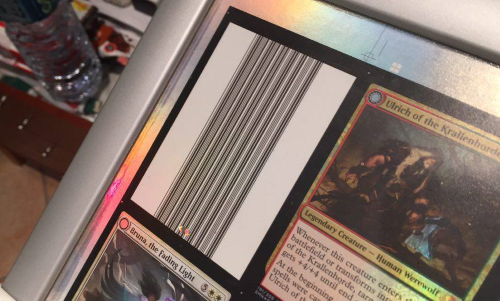 Black Round or Square Corner Shiny Filler Card from Italian Urza's Legacy Foil Common/ Uncommon 10 x 11 uncut sheet (Flash to show the shiny/foil on the filler). 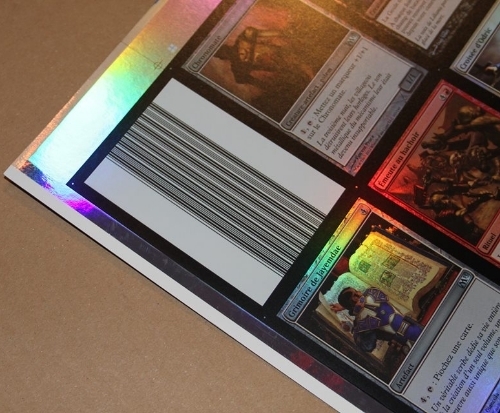 Black Round or Square Corner Shiny Filler Card from English Urza's Legacy Foil Common/ Uncommon 10 x 11 uncut sheet printed by Yaquinto Printing Company. Black Round or Square Corner Shiny Filler Card from English Urza's Legacy Foil Common/ Uncommon 10 x 11 uncut sheet printed by Yaquinto Printing Company close up. 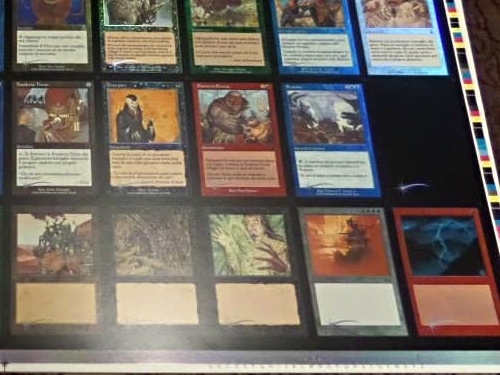 Modern Masters 2015, uncut regular and foil sheets are 11 X 11. 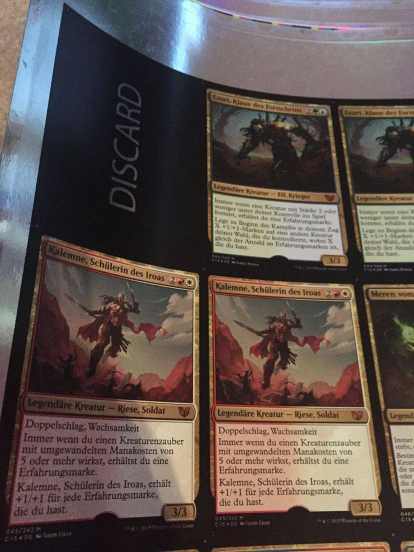 MYTHIC sheet: contains one Foil Discard Filler with No Hologram. 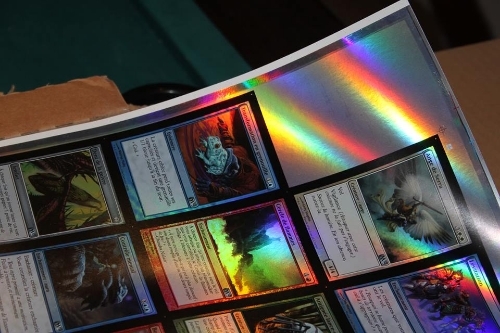 RARE sheet: contains 3 Foil Discard Fillers with Hologram and 12 Foil Discard Fillers with No Hologram. UNCOMMON sheet: contains one Foil Discard Filler with No Hologram. 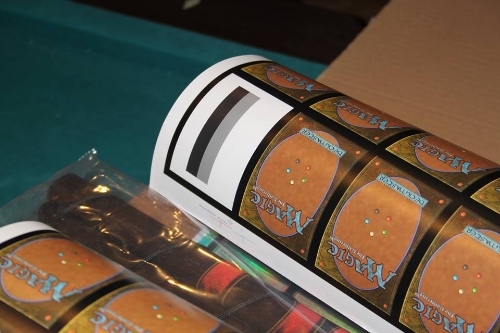 COMMON sheet contains 22 Foil Discard Fillers with No Hologram. So, if you take the 4 Uncut sheets, that's a total of 35 Foil Discard Fillers (32 Foil Discard Fillers and 3 Foil Discard Fillers with Hologram). For the 4 Uncut sheets not foil, it's also 35 Discards Non foil fillers (32 Discard Fillers and 3 Discard Fillers with Hologram). This is the first time ever that so many fillers will be on 4 Uncut sheets. 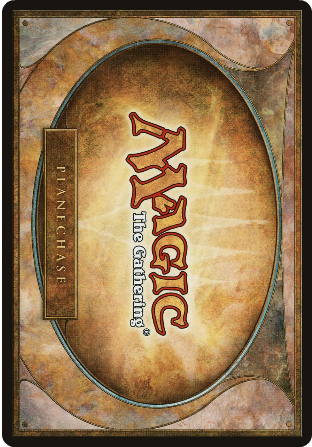 Meaning that the regular Discard Filler will be probably one of the most common filler in existence (As it comes from 7 different sets since 2012), the Foil Discard filler will be also widely spread, the Foil and non Foil Discard filler card with hologram will be the rarest ones out of the Modern Masters 2015 set. 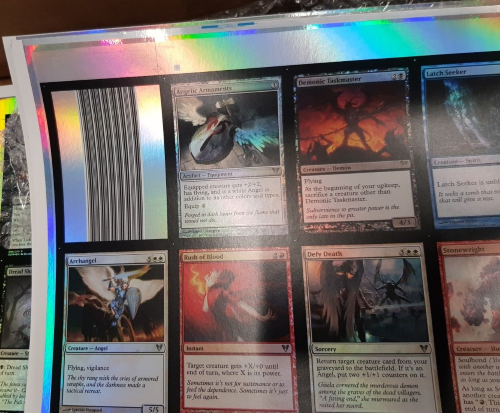 Foil Discard Filler with No Hologram (row 11) from Foil Mythic Modern Masters 2015 uncut sheet. 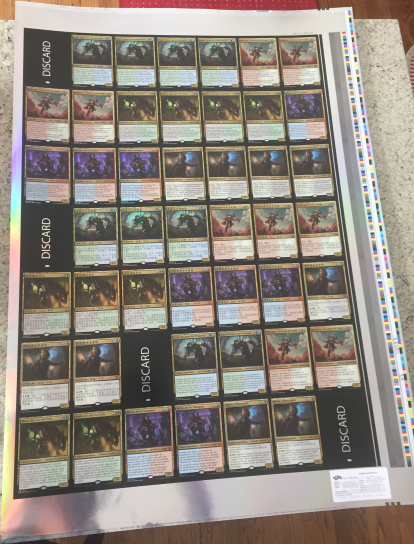 3 Foil Discard Fillers with Hologram (first 3 filler cards on row 10) and 12 Foil Discard Fillers with No Hologram from Foil Rare Modern Masters 2015 uncut sheet. 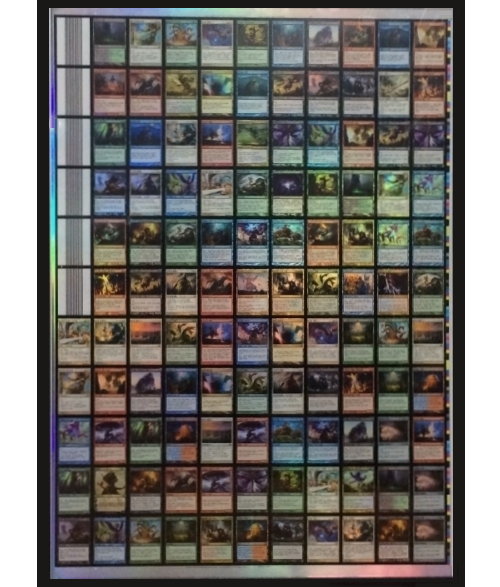 Foil Discard Filler with Hologram (row 10) and Foil Discard Fillers with No Hologram (row 11) from Foil Rare Modern Masters 2015 uncut sheet. 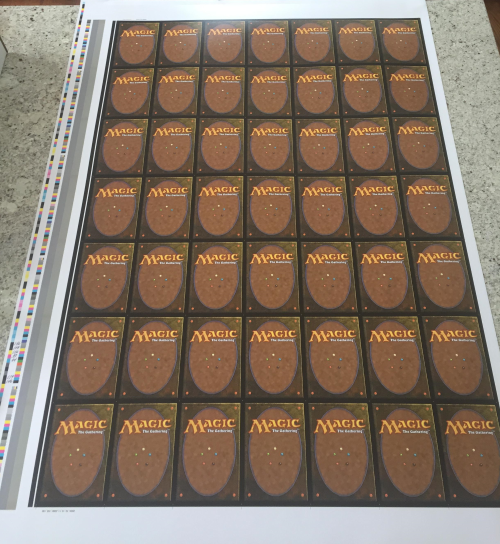 Foil Discard Filler with No Hologram (row 11) from Foil Uncommon Modern Masters 2015 uncut sheet. 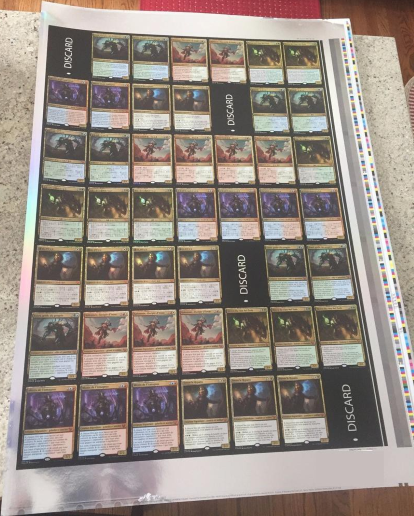 Foil Discard Fillers with No Hologram (row 10 and 11) from Foil Common Modern Masters 2015 uncut sheet. Overzized Archenemy Black Round Corner Filler Card Front and Back. Overzized Commander Filler Card from Commander Deck with Foil "BLANK" Letters Front and Back. Oversized Planechase Filler card Front and Back. Commander 2015 (French, Japanese, Italian ) 7 X 7 uncut sheet with 4 Overzized Foil Discard Filler Cards with Holofoil Stamp front and back. There are four of each general in French, three of each general in Japanese and two of each general in Italian. MTG Back. Commander 2015 (German, Simplified Chinese, Spanish) 7 X 7 Press Approval uncut sheet with 4 Overzized Foil Discard Filler Cards with Holofoil Stamp front and back. There are four of each general in German, three of each general in Simplified Chinese and two of each general in Spanish. MTG Back. Commander 2015 (German, Simplified Chinese, Spanish) 7 X 7 uncut sheet with 4 Overzized Foil Discard Filler Cards without Holofoil Stamp front close up. White back.